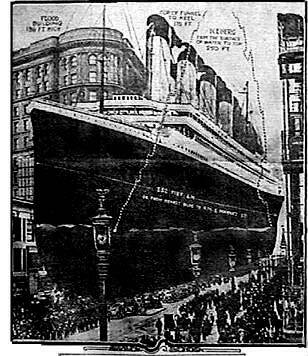 The April 17, 1912 edition of The San Francisco Examiner featured a front-page photograph to illustrate the sheer size of the sunken Titanic. A drawing of the ship was superimposed over a view of San Franciscos Market Street. The Titanic is shown at the intersection of Powell Street, with the familiar James Flood Building in the background to give a sense of scale to the illustration . The James Flood Building stands 186 feet high, and the photograph illustrates that it is slightly taller than the distance between the keel of the Titanic and its funnel175 feet. The artist also drew in an approximation of the iceberg which sank the Titanic, to show it was 250 feet from the waters surface to the tip of the iceberg. Go to Dr. Dodges eyewitness account.